Follow this link for a preview of the full movie (provided by Dr. Mercola through 2/13/2015). The film traces the origins of our beliefs about healthful and unhealthful food. Experts from all over the world talk about the problems as well as short and long term solutions. Among the many experts in the film are authors like Gary Taubes, Mark Sisson, and Melanie Warner. Medical doctors such as David Perlmutter M.D., David L. Katz, and Timothy Noakes share insights that are certain to challenge the status quo. Carb-Loaded: A Culture Dying to Eat is a chronicle of the things it's writer and director Lathe Poland learned after he was diagnosed with Type 2 diabetes. He sought to find out why he got sick, because he didn't fit the classic picture of an adult onset diabetes sufferer. He quickly learned that much of what he knew about healthy eating was based on myths or fifty year old science. 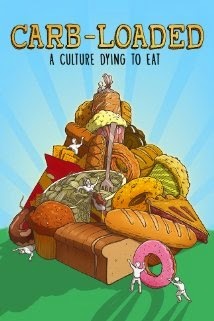 In the film he searches out why Americas modern food culture is killing us. The upside? There is a lot that can be done!